Chances are you’ve been to Bangkok before—after all, it is the most popular tourist destination in the world. You’ve probably seen the main temples, cruised along the Chao Phraya River, enjoyed some cheap massages and eaten the best pad Thai of your life at a local market, but there’s more to this city than cheap and cheerful, and a lot more to explore besides the obvious tourist traps. Despite the series of recent hardships it has endured, the Thai capital shows a dynamism and modernity that is intoxicating, and increasingly nodding towards a new level of sophistication. Sure, backpackers can still be found stumbling down Khao San Road in search of cheap beers—but for those inclined towards the more indulgent, the options are countless. Say hello to sophisticated bars elevating the art of mixology, award-winning restaurants, a booming art scene and opulent spa havens. The recently opened Park Hyatt—the first Park Hyatt in the country—is where you’ll want to stay. The property is located near the capital’s business districts of Ploenchit and Chidlom, which bustle with quality eateries, luxury stores and upscale offices. The complex hosting the hotel is infinity-shaped and boasts a façade made of more than 300,000 aluminium shingles inspired by the motifs of the city’s many temples, making it an architectural marvel and a distinctive new presence on the city’s skyline. But it’s the interior by star designers Yabu Pushelberg that’ll have you reaching for Instagram: showing a delicate grey-on-cream colour scheme, hidden nooks and striking contemporary art throughout, this place is a study in sleek. There’s a spa with crystal-steam rooms, a rooftop terrace with panoramic views of the capital and a saltwater infinity pool overlooking the lights of the city. All of the 222 rooms feature huge marble bathrooms, plush beds and state-of-the-art video and sound systems, though you wouldn’t expect anything less from the Hyatt. Besides the obvious luxury fixtures, it’s the service—relaxed but attentive—and the overall ambience—unpretentious, and friendly—that make the property. When it first opened in London, Nahm was the first Thai restaurant in the world to earn a Michelin star. The ranking hasn’t made it to Bangkok yet, but David Thompson’s dining concept at Como Hotel is equally amazing in its local iteration. It serves out-of-this-world amazing Thai cuisine—a must-try for any Bangkok visitor. 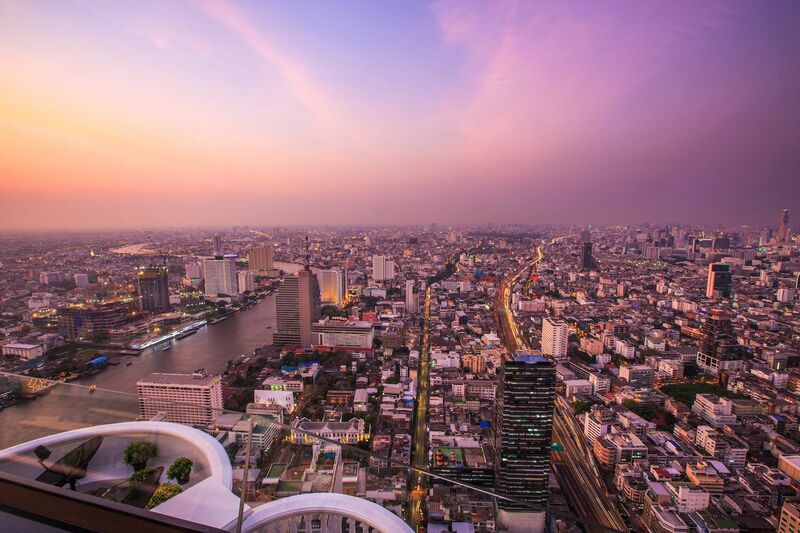 Bangkok knows how to do sky-high rooftop bars, and heading to one on your first night is the best way to kick off the weekend. The latest to see and be seen is Alfresco 64. Perched 800 feet in the air on the 64 floor of the Tower Club at Lebua, it is the highest outdoor whisky bar in the world, and grants breathtaking aerial views of the city skyline and the Chao Phraya River. Shady paths, lush lawns and a convivial atmosphere: Lumpini Park is a rare and beloved green public space in the city. Visit before 7am (or around sunset, if you had one too many whisky sours at Alfresco 64) and watch people do tai-chi and aerobics, or rent a paddleboat on the artificial lake. Then go back to your hotel for breakfast, a swim and some sunbathing. Recharged? Good. The day’s ahead is looking pretty packed. One of Bangkok’s most popular shrines despite its relatively small size, the site honours the four-faced Braham God Than Tao Mahaprom. Built in the 1950s, it is a symbol of faith for thousands, and an interesting testament of the importance of religion (both Buddhist and Hindu) in modern Thai society. A hipster version of a Thai street market, Eathai is a huge new food court in the basement of Central Embassy, the complex hosting the Park Hyatt. Different cooking stations are divided into northern, southern, Isan (northeastern Thai) and vegetarian cuisine, and boasts every local food and Thai regional cuisine you could dream of. Grab a tray and pick and choose between som tam (spicy papaya salad) and khao soi gai (a rich coconut soup with egg noodles and chicken), yam jae (spicy salad with grass noodles and vegetables) and massaman curry. Perhaps Bangkok’s hippest art space, this is one of a few purposely built commercial art galleries in the city. It was conceived by art collector and street culture filmmaker Akapol ‘Op’ Sudasna and his partner Supamas Phahulo as a white canvas both inside and out, and displays contemporary artworks by local artists. A trip to Bangkok wouldn’t be complete without a spa experience. For Thai-inspired, luxury service try Devarana Spa. Spacious rooms, tent-like rest areas, plush sofas and flawless facilities make for an ultra-soothing setting. Need we say more? Opened earlier this year by Noma-trained chef Garima Arora, Gaa is the new restaurant everyone is talking about. Two seasonal tasting menus are made mostly of ingredients found along the strip of land from Northeast India to Bangkok, blending modern techniques with traditional cooking methods. Top tip: skip the wine and opt for the juice-pairing packages instead, which include freshly pressed juices and house-made kombucha. You might not think of Chinatown as a destination for discerned drinkers, and yet this area of Bangkok counts some of the most interesting bars in town: Tep Bar puts a Thai spin on well-concocted libations using local (and potent) local spirits, Ba Hao is Chinese-themed both in its striking interiors and drink menu, and 16-seater Teens of Thailand has earned a cult following for its gin infusions made from whatever the owners find from neighbouring Chinatown stores. The former residence of the eponymous American silk entrepreneur and art collector offers an oh-so-charming glimpse into Bangkok’s mid-20th-century history, both in terms of the complex’s architecture and Thompson’s stunning Asian art pieces and possessions, on display in the main house. Don’t be fooled by the (really neat) retro feel of this place: 80/20 delivers some of the most forward-thinking fare in town. As the name references, 80 percent of the ingredients are locally sourced, whether produced in-house or purchased from wet markets. Fusion best describes the cuisine: expect lots of creative experimentations and a focus on bold, innovative flavours that play with Thai traditions. Four thousand square metres of abandoned World War II-era warehouses compose Warehouse 30, a recently opened creative and retail hub. From a co-working space to indie boutiques, cafes, art spaces, juice bars and hip dining options, this is Bangkok’s latest hot spot. Stroll around, grab a coffee and browse the wares on offer. Bid adieu to Bangkok and head home with an evening flight from the airport.